Shamrock was built in the Stonehouse yard of Frederick Hawke as a Ketch rigged Tamar sailing barge in 1899. Shamrock is 17.5m (57ft 6in) long, has a beam of 5.51m (18ft 1in), a hold depth of 1.62m (5ft 4in) and was initially registered as of 31.71 tons gross. Her hold is 6.7m (22ft) by 3.5m (11ft) and main mast is 12.5m (42ft) high. After a long varied working life she ended up being used as a scrap iron store in Hooe Lake Plymouth. 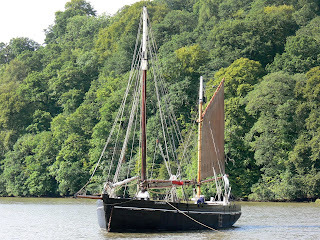 She was acquired by the National Maritime Museum and, in conjunction with the National Trust, taken to Cotehele Quay in 1973 as a restoration project. The restoration restored Shamrock to as she was after being converted to a coastal vessel in the early 1920's and was completed in 1979. She now has the distinction of being the last working ketch-rigged Tamar Sailing barge. Shamrock was named after the unsuccessful Irish challenger for the 10th America's Cup Race in 1899. She is considered to be the most advanced Tamar sailing barge ever built - it was a conscious effort to design a vessel which would carry the maximum cargo for her size on the minimum draft and at the lowest operating and maintenance costs. 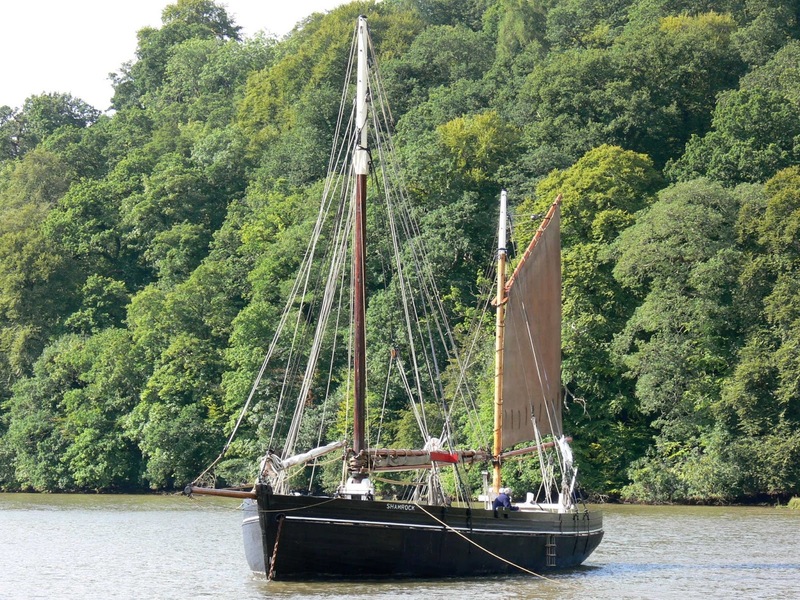 Shamrock is now permanently berthed at Cotehele Quay, a National Trust property, and still has occasional trips up and down the river. Shamrock is listed on the National Trust Collections website, and has inventory number 348277. She is also listed on the UK National Historic Ships Register, maintained by the National Maritime Museum, Greenwich, London, and has Certificate number 665. All 64 Shamrock shares are owned by the National Trust. A characteristic feature of a Tamar barge was the warping horse which is painted white on Shamrock. Under the beam shelf are holes which sometimes had boxes fitted under them where rock salt was placed. As salt is hygroscopic, it pickles the wood so the deck would be washed with salt water at the end of each day and left overnight before the heat of the day dried the salt into the wood. Falmouth oyster dredgers and Thames shrimp bawleys by the nature of their work were constantly washed down with salt water so had a reputation for longevity. Thanks to Alan J Viner for his book 'THE RESTORATION OF THE KETCH-RIGGED TAMAR SAILING BARGE SHAMROCK 1974-79'. The main source of the restoration information used in this blog. Marina Dewing for 'A Perilous Homecoming'.